As a senior at Kenyon College in Gambier, Ohio, I’m employed on my college’s student-run farm. On the Kenyon Farm, we follow organic practices and are implementing permaculture as we grow. I’m an environmental studies major and I care about carbon emissions, waste, energy use, and land management related to agriculture. I’m working to figure out how I can best play my part as an agriculturalist, promoting sustainability, while also working to help feed the world. 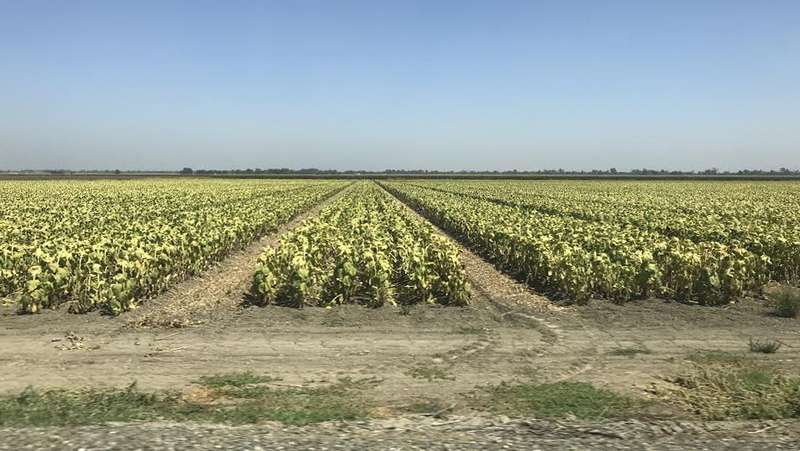 This August, I traveled to Woodland, California, with Planet Forward to learn about the large-scale farming operations that are currently feeding the United States. My goal for this trip was to see the other side of agriculture — the genetically modified and industrial side — and decide for myself what sustainable farming looks like. At the Kenyon Farm, we are in a temperate deciduous biome. We get plenty of rain, grow crops that make sense in our cold hardiness zone, and let the outskirts of our land rest as natural forests. The Central Valley of California, on the other hand, is naturally a desert, but now water is diverted for irrigation and farmers can control the exact amount going to their fields. This provides the perfect conditions for growing a variety of fresh fruits and vegetables that feed the U.S.
For most of the summer, there isn’t a single cloud in the sky. Here, plants get all the sun they can handle, and farmers will often shade crops to prevent them from getting sunburnt. This valley, with irrigation, provides the ideal conditions for farmers to control what their plants receive, meaning they get high yields and have the potential for precise data collection and experimentation. Yet there is a tension here, between diverting water from natural ecosystems and providing fresh, nutritious food to people across the country. Many people see small- and large-scale agriculture at two opposite ends of a spectrum, as well as conventional and organic farms in the U.S. Many environmentalists presume that small farmers are responsible stewards of the land and that they follow organic practices. In a similar vein, many people presume that large, conventional operations produce waste without regard for the environment. As a farmer myself, I was curious to see what the “other side” is doing to have such a negative reputation with environmental groups. At the same time, I cannot ignore the reality that we produce a lot of our food today using industrialized agriculture. And, as our climate continues to change, farmers must adapt to new conditions while still providing nutrient rich, full diets for our exploding global population. These contradictions lead me to think that the ecological industrialization of agriculture will be necessary and inevitable. Foley proposes a discussion of diverse farming methods that isn't framed as an argument, because both movements are recognizing important needs of humanity and the Earth. If we hope to reconcile people with the natural world around us, we must also recognize that we will always have some impact on our environment if we keep producing food. Now it’s up to us to decide what that impact will be. The Morning Star tomato processing plant, our first stop in Woodland, is the largest tomato processing plant in the world. With that reputation, I expected to have some misgivings about how they process their tomatoes. I realized, however, that I had this bias as an environmentalist simply because Morning Star is such a large plant. In reality, Morning Star makes informed decisions about its waste management strategies and this often saves the company time and money, therefore finding greater efficiencies. Reducing environmental impacts can be profitable. All of Morning Star’s tomatoes come from local growers, most within an hour’s drive from the time of harvest. Water used at the plant is recycled and flows by gravity. When this water eventually becomes waste, it is used as fertilizer on the adjacent acres of grassland, which the company bails as hay sells to local livestock operations. Morning Star boasts that its operation is virtually zero waste, with pomace (the leftover skin, seeds, and stems from tomatoes) leaving the plant as a byproduct that is sold to cat and dog food companies, cattle ranches, or is used for compost. While these waste-reducing practices are to be applauded, the scale of Morning Star’s operation does have some waste built in to it. As we drove up to the plant, the roads were littered with bright red tomatoes that had fallen off the trucks on their way from being harvested. The question remains whether less wasteful practices would have a significant impact on the amount of tomatoes that the plant can process, because producing food is their primary concern. During the tour of the Morning Star facility, it was apparent that the ideas of organic agriculture, conventional agriculture, conventional breeding, and genetic modification were getting confused in our everyday discourse about these issues. Grace Warner, a sales representative for Bayer seeds, clarified that organic and conventional agriculture refer to how the plant is grown, and that this has nothing to do with where the seeds come from. On the other hand, both conventional breeding and genetic engineering are ways of breeding plants (i.e., producing desired seed), and both are forms of genetic modification. While genetic engineering is a purposeful addition of select genes in a lab, in conventional breeding, humans select for desirable traits and modify the gene pool simply by planting what we like. This has been happening for thousands of years; sticky rice, sweet potatoes, sweet corn, and Granny Smith apples are all examples of plants whose gene pools have been modified, reflecting what humans desire and prefer. Michael Pollan’s “The Botany of Desire,” details how humans have shaped the environments, plants, and animals around us since the advent of agriculture. The Morning Star employees told us that they do not purchase organically grown tomatoes. In their eyes, the two main setbacks of organic agriculture are that organic farmers cannot plant genetically engineered seed, and they cannot use pesticides like glyphosate on those crops. Raoul Adamchak, who manages the certified organic farm at UC Davis, feels that organic and conventional growers could actually learn from each other’s practices. He says that only 1% of the agricultural land in the U.S. is farmed organically, while the other 99% is farmed using conventional methods. He believes that conventional growers can learn about ecological land management from organic growers, such as planting cover crops, using low-till practices, and implementing integrated pest management systems (IPM). On the other hand, if organic farmers could plant seed that is genetically engineered to be resistant to certain pests, organic operations would not have to spend as much money or labor spraying certified organic herbicides and pesticides on their crops. One of the most important potential impacts of organic farmers accepting genetically engineered (GE) seed would be that consumers may start to change their views on GE and realize how this technology can benefit organic farmers (in terms of reducing resource, land, energy, and pesticide use). This move could make ecological farming more common across the U.S. by breaking down the existing duality between organic and conventional growers. Raoul cites an important interdependence between organic and conventional farmers. Organic producers prefer to use composted manure on their fields, and when their own operations do not involve compost or livestock, they will often purchase manure from local, conventional livestock operations. Yet these conventionally grown animals are often fed GE corn or soybean, providing vital nutrients to organic farmers and allowing them to avoid using synthetic fertilizers. Without the livestock that is fed GE crops, it’s possible that organic farmers would not have enough organic fertilizer to run their operations. Raoul’s point here is that the two methods of farming are more interdependent than most people realize, and working together can often benefit both sides. I asked Raoul if he thought allowing genetically engineered seeds into organic practices would open up the door for organic farmers to plant crops engineered to withstand pesticides, and then spray their fields with those pesticides. He laughed at the thought of engineering a crop to be resistant to citrus juice, a common herbicide in organic farming. His point was that even if organic farmers would accept genetically engineered seed, they would still avoid spraying when they could, and if necessary, only spray what is certified organic. This is because most organic farmers want to reduce damaging pesticide use, not increase it. Planting genetically engineered seed would allow organic farmers to plant crops that are resistant to the pests that current organic pesticides are ineffective in attacking. It would also open up the door for organic farmers to plant crops that have been engineered for higher yields; a common criticism of organic operations is that they produce lower yields, and this is one reason that more farms are not organic. GE crops would open many avenues for organic farmers, because they could plant crops engineered to have higher nutritional content, for example, if such a crop was desired by consumers in the U.S. in the future. Technology plays a large role in agriculture today, with an increasing number of innovations being used on America’s farms and across the globe. Some examples are GPS systems that allow farmers to track what amount of water and fertilizer goes into each plot of their land, genetic engineering to enhance flood tolerance in rice, and the newest, most precise tractors for harvesting. Many farmers are passionate about these new technologies because they make their lives easier, for example by limiting the hours farmers work and the physical labor they exert. Yet the sustainable agriculture movement does not always embrace industrial technologies because these machines often release carbon from the soil and burn fossil fuels, while there still remains an ecological way to farm without creating so much waste and pollution. John Purcell, the vegetable R&D lead at Bayer, views technology as a positive in agriculture. “That’s how food production is done,” he says. “It can’t be a romantic ideal.” While the romantic vision of sustainable agriculture would include practices like no tillage, crop rotation and integration, and not using genetically engineered or modified crops, few large farmers implement these methods. Many of today’s career farmers are financially tied to their farming practices, investing hundreds of thousands of dollars into tractors and machinery. They also are tied to their business relations because of these investments. The question remains whether ecological farming methods, like those used on organic farms, could produce as much as industrial methods do. I don’t blame a farmer that isn’t willing to bet their livelihood on being more ecological. On the other hand, I personally wouldn’t choose to invest my livelihood in expensive industrial technologies as a young farmer getting into the field today. I hope to be open to innovation and new methods, and want the opportunity to change my practices when the world around me is doing the same. John believes that the younger generation of farmers will be more apt to use new technologies, because tech comes more naturally to us. As a young farmer, I have to admit that some of these technologies appeal to me, but others don’t. I would love to collect data on the nutrients added to my fields and have GPS maps of my land. Yet I’m not interested in investing in huge tractor equipment that cuts through land, releasing carbon from the soil and burning carbon in the process. I hope that there’s a way to respect the integrity of the land and retain the natural ecology of a place, while producing enough food for our global population through innovation. If this solution is only possible with the use of GE crops that are more resilient, more nutritious, and more resource efficient to grow, then I would support the use of genetic engineering in organic agriculture. John says that “waste, energy, water, and soil all should be in confluence,” and that a farmer who implements this “fits any definition of sustainability.” I think that in order to be sustainable, farmers will have to be willing to learn about the more efficient and nutritious ways to feed the world, even if that means integrating new technologies and practices into their current systems. Mitigating the effects of global climate change and our exploding global population will require that we adapt to the circumstances and tools at our disposal. As both a farmer and an environmentalist myself, I used to see organic farming, as it exists today, as the solution that would allow humanity to grow fresh food and protect our planet. What I realized, however, was that a large-scale industry like Morning Star can take steps to mitigate waste and compost nutrients, and so can an organic farm like the one at UC Davis. And we must recognize that the large-scale operations keep food on our tables. There are markets for the tomato paste processed at Morning Star, and for UC Davis figs grown locally and organically. These two types of farming systems actually complement one another because they provide people in the U.S. with the food they want to buy, and they give us options. Whether I’m at home on the Kenyon Farm in Ohio or touring a Bayer plant research facility, I can come across a perfectly ripe tomato on the vine, pluck it off and taste the same juicy sweetness. I think as long as people have enough to eat, we should work to make our farming is as ecologically sound as possible, so that we can ensure food security into the future.